Individual indoor/outdoor runs: Your pet will enjoy as much fresh air as desired. Not only is this important for well-being, it is much healthier than being in a re-circulated air environment. The length of the exterior run is 16 feet long. 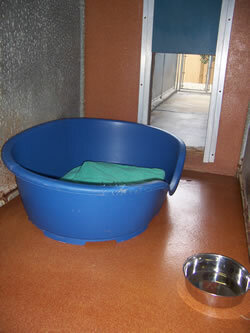 The interior space is approximately 5 feet with a raised bed, food bowl and 72 ounce water bowl mounted in the door. Our floor surfacing is poured cement, which unlike asphalt, will never cause abrasions on your dog's sensitive pads. This surface also allows us to disinfect and power- wash daily to maintain the highest standards of sanitation. Medications, prescription diets and special needs/elderly pets are under the supervision of a Registered Nurse. Heated & air-conditioned for your pet's comfort. Daily Playgroups with carefully screened friends and individual Walks. Bathing: Available at a discounted rate for our boarding guests as well as by appointment. Iams Premium Pet Food or you may bring your own.